My Heroes in the Street, Studies for Pictures on Canvas, is a suite of 10 compelling works by one of the pioneering forces behind Vancouver's emblematic brand of photo-conceptualism. 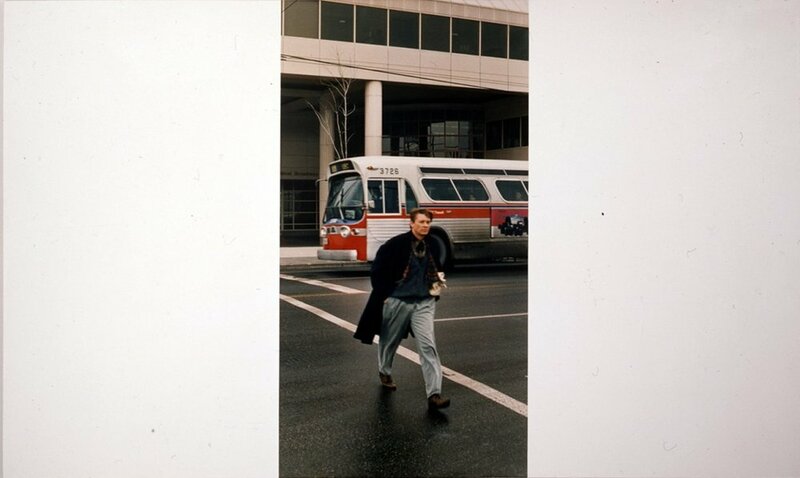 The portfolio of 10 works, originally commissioned in 1986, explores reflections of Vancouver streets from passing shop windows and rear-view car mirrors, white painted crosswalks, and “heroes” who walk those city cross-walks and sidewalks, finding an abstract geometry within the photograph. The artist has described some of the ideas informing this series of works, which has also taken the form of large-scale canvases, as follows: "The street is the site, metaphorically as well as in actuality, of all the forces of society and economics imploded upon the individual, who, moving within the dense ‘forest of symbols’ of the modern city, can achieve the status of the ‘heroic’…"
Each of the 10 images consists of an Ektacolor photograph mounted on a 15" x 22" sheet of Stonehenge lithographic paper. These sheets have been printed with two references to the idea of ‘the gallery’: an outline rectangle for the photograph, and a line representing the intersection of the floor and wall. Ian Wallace lives in Vancouver. His paintings, photographs and critical writing are internationally and critically renowned. This series was commissioned by The Canadian Photographic Portfolio Society. CPPS supports the development of Canadian photography by commissioning work from ground-breaking artists making significant contributions to contemporary art.